Tyler Rhodes appeared on Show 249, recorded in March 2012, at age 18. Tyler Rhodes (guitar), 18, is from Austin, Texas and attends Westlake High School. He ­­­is a recipient of From the Top’s Jack Kent Cooke Young Artist Award. Tyler studies with Kevin Taylor, founder of the Childbloom Guitar Program, and has participated in the Austin Bella Corda guitar ensemble, as well as Westlake High School’s Chorale and Madrigals. 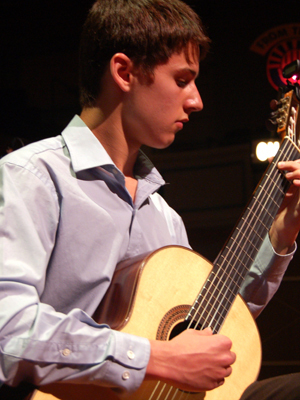 He has also attended Mid-America Guitar Camp and the Musical Minds Festival and Competition. Aside from guitar, Tyler loves boating, anime and manga, and spending time with friends. Tyler is a Jack Kent Cooke Young Artist.